Neo Traditional tattoo style first time appeared around the early 2000’s. Since then, little by little it spread around the world, and today it is a trendy style, especially among the younger people. Often, many people think that the old-school and neo-traditional tattoos are the same. But this style combines the traditional and modern style and their colors and details into one unique and beautiful creation. Let’s take a more in-depth look at them. 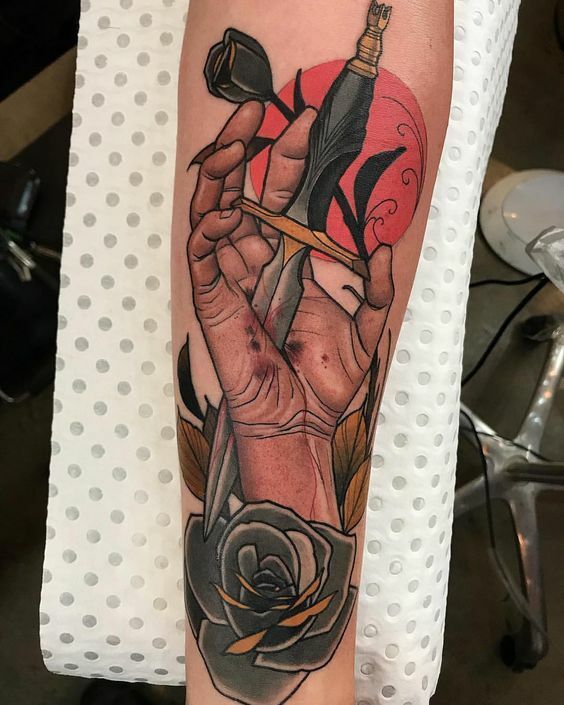 What is a neo traditional tattoo? As we’ve mentioned, neo-traditional tattoos combine the elements of the modern and traditional styles. Unlike the old-school, this style include modern techniques which makes them look more complex and detailed. Usually, neo-traditional tattoos use thick lines and more colors. Another significant detail is the shadows which create the space. One of the main reasons for the birth of this new style was the appearance of the new tools, which allowed the artists to reach a new level. The most notable artists that began to experiment with new techniques were Uncle Allan, Luis Lips, and Adrian Edek. First neo-traditional tattoos were a result of experimentation and testing of new technologies. Of course, we can see that old-school style had a significant impact on the neo-traditional tattoos. But when we look closer, we can see that these two are very different styles. For the person who is not very familiar with tattoos, the difference may not be so noticeable. But an experienced eye can quickly tell which one is which. To begin with, let’s take a look at the technical characteristics. Although the two methods use similar lines and colors, unlike the old-school style, the neo offers a broader range of line thickness and more colors. All these features result in a tattoo which is more detailed and looks much more realistic. Also, old-school tattoos have a limited color palette, while the neo-traditional style has much more color options. Therefore, due to the broader range of colors, shadowing and thickness of the lines we now have what we call the neo-traditional style. However, the old-school tattoos are more durable and resistant to the blurring, while the neo-traditional tattoos will become blurred after some time, and will need retouching. As for the themes and motifs, we can see that the most popular designs are the same as for the old-school tattoos. People mostly prefer skulls, animals, and other traditional elements such as daggers, candles, roses, and others. Although, with the new techniques, you have much more options which you could not achieve with the traditional style. And yet the neo-traditional tattoos evolve. New styles born every year with more and more skillful artists showing off their works to the world. If you love neo tattoos, check out our excellent selection. Now when you know much more about them, we hope you’ll find the one you like, and it will be an inspiration for your tattoo!